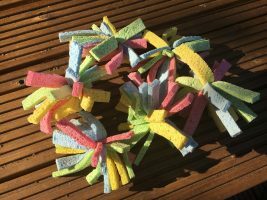 If the children need to cool off in the heat try these home-made water bombs! I made these a few years ago, so I can’t actually remember where the idea came from, but these are really simple and cheap to make for a bit of outdoor summer water fun. In fact so simple the children could make them themselves. Cut the sponges into strips (not too thin otherwise they will rip too easily). Gather together about 8 strips and wrap an elastic around the middle a few times – tight enough so they don’t fall apart, but not too tight that the strips rip off when thrown. Separate the pieces into a make-shift ball shape. Fill a bowl or bucket (or more than one, the children might want one each!) with water. Soak the sponges, find your target and get ready to get wet! Have fun! And when the fun is over, leave them to dry and keep them for next time.